Born and raised in Lorain, Ohio, David began playing golf in 1967. 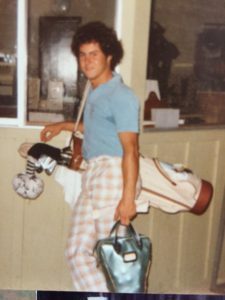 As a competitive junior golfer he was good enough to qualify for the Jr World Championship in 1974, to be held in San Diego! His parents put David on a plane and after playing Torrey Pines for a week his life was changed. As an All American High School student athlete, his team was undefeated his senior year and finished 4th in the state championship. Along the way he won many junior events one of the biggest was the Ohio Northeast Junior Championship. Attending college but not finding it interesting enough, he returned to Ohio and worked in the steel mills. He then decide to move to San Diego and turn pro at 21 and began a career in golf. 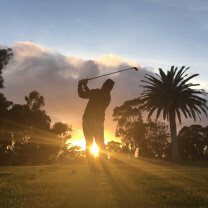 It first started at Rancho Santa Fe Golf Club, where he was hired on as a range attendant and 2 years later was a assistant pro and then a group of members sponsored him to fulfill his dream of playing on the PGA Tour. 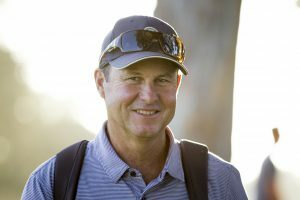 After competing on mini tour events, he then decided to become a PGA Golf Professional and earned membership to the PGA in 1988. Teaching became his passion and in 1992 was hired on the staff at Ken Blanchard Golf University where he was the lead instructor for 10 years. Since then his teaching jobs include, Director of Instruction at The Hodges Golf Center, a teacher at the Crossings at Carlsbad, and currently a partner at Goat Hill Park, home of the NCJGA. David has lived in Oceanside since 1984 with his wife Marcia (currently CFO of NCJGA) and have two boys Evan 26, assistant golf coach at San Diego State, and Alex 20 currently playing baseball at Sonoma State University. partner at Goat Hill Park, home of the NCJGA. David has lived in Oceanside since 1984 with his wife Marcia (currently CFO of NCJGA) and have two boys Evan 27, assistant golf coach at San Diego State, and Alex 22 currently playing baseball at Sonoma State University. 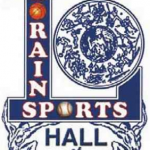 Congrats to Coach Dave as a Class of 2017 Lorain Sports Hall of Fame Member! Click the image below for the story.